The latest game in the NBA 2K series is frustrating to play if you don’t want to spend any additional money on top of the $60 you have to shell out to get the game. Technically, you don’t ever need to buy anything in NBA 2K18. It’s just much, much easier if you do. Virtual Currency is the only currency in the game, and was introduced in the 2012 installment (NBA 2K13). It’s something you’ll use across game modes in 2K18, but it’s especially prevalent in the single-player myCareer mode, where you use it both for upgrading characters and customizing them. In 2K18, like other installments, you’re able to earn Virtual Currency after every game, and you’ll start off with 6,000 VC. That seems generous until you actually start having to use your VC, where you’ll find that things are pretty expensive. When I spent the entirety of my 6,000 VC on my character, Xavier World Peace, he went from an overall rating of 60 to 62. You can still earn VC by playing games and it will scale with how well you play during the game, as it has in previous games in the series. But still, playing a game with my modest skill only netted me around 500 VC. Once I’d accrued another 1,000 VC, I tried to upgrade World Peace again. Fooling around with different stats, I realized that I’d be able to raise his overall rating one point if I spend about 4,000 VC. If you’d like to customize your character in any way, Virtual Currency becomes even more precious. In particular, if you want to change your character’s hair, you have to purchase a haircut before you see it on the character itself. 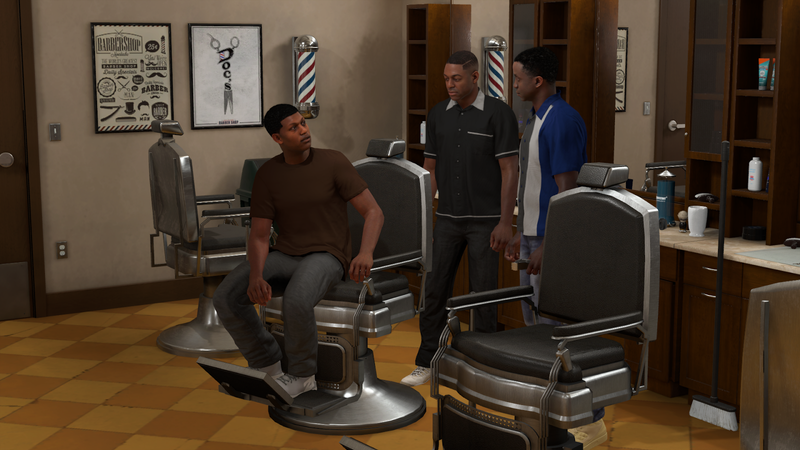 You also won’t be able to see the price until you put it in the cart—this particular haircut costs 1,500 VC. Not all haircuts are this expensive, but this is just a small part of character customization. What if you want a tattoo? Well, all tattoos other than the 2K logo are locked until you reach an overall rating of 70, and then actually adding the tattoo to your character costs an additional 1,000 VC. This is the same for clothes, shoes and player animations—you have to raise your overall rating to unlock the good stuff, and then you still have to pay VC to actually purchase it. Want Michael Jordan’s signature dunk? Well, first you have to to unlock it, and then you can still have to pay for the animation. That means you have to play hours of games to earn VC… or buy 75,000 of VC for $20. In general, playing myCareer mode is a constant reminder of how much VC you don’t have, as the game will frequently present you with the option to purchase more. Fans of the NBA2K series aren’t wholly opposed to the idea of buying a currency, but the overall sentiment online appears to be that 2K18 feels more predatory than previous games in the series. One fan estimated that in order to get to an overall rating of 86 and not spend any money, you’d have to play over 200 games. 2K has not responded to requests for comment on NBA 2K18’s VC system. Microtransactions like these are never popular with players, and for good reason. Who wants to spend another $20 when they’ve already spent $60 on the game itself? It’s disheartening to see a basketball series I’ve enjoyed in the past feel so sleazy in its latest installment. At least let me preview the hair, NBA 2K18. Not everyone looks good with dreads.